Fokker Dr 1 152/17; Flown by Rtm. Manfred Von Richthofen, March and early April 1917. RC model by Dave Millard (DMill83234@aol.com). Published by Albatros Publications Ltd. I looked at my bookshelf and saw five books dedicated to Manfred von Richthofen, and I know of at least 20 others. What could justify another retelling of such a well known tale when so many deserving characters have untold stories? I have to admit I was quickly engrossed in this new book from Albatros Productions Ltd. Mr. Ferko covered some heretofore unrevealed facets to the von Richthofen saga which I had never seen before. In the end, I determined the coverage of unusual subjects seemed to lack a real direction and were only told because of their oddity and not their historical value. There also seemed to be an intentional lack of objectivity that put the reader and the author in an adversarial role whose only purpose seemed to be to keep the reader's attention. Richthofen by A. E. Ferko is an 80-page soft cover book. There are many outstanding pictures some of which had never before been published. Artwork by Ray. Rimell highlights the book in three pages of color plates, as is typical of the offerings by Albatros Productions. These fine plates show a good selection of aircraft flown by Manfred von Richthofen. The book is overpriced at 21 pounds (about $35.00), but part of the problem here is a poor exchange rate between the U.S. dollar and the British pound. Although Ferko writes the book in a conventional narrative style, at times he tries to cover the more uncommon aspects of von Richthofen's war years. One of the best examples of this is a section covering a dispute von Richthofen (as Jagdgeschwader I Commander) had with an officer at Air Headquarters. Apparently a Hauptmann Bufe believed that the squadrons should be deployed so as to form an "impenetrable front", much like a static trench line. 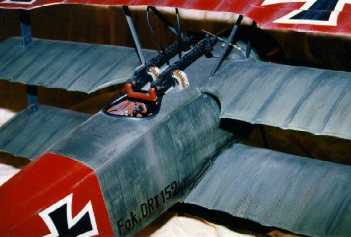 Von Richthofen thought this was implausible and favored a more fluid deployment of air assets. As it turns out, von Richthofen was right and his theories are still discussed today at the Air Force's Air War College. Incredibly Ferko contends von Richthofen was out of line and should not have questioned an officer at Headquarters. Ferko attributes von Richthofen's actions as aristocratic snobbery, and when von Richthofen appeals to senior officers and his tactics are seen as the correct ones, Ferko simply accuses von Richthofen as being a superior politician and not a revolutionary tactician. Apparently Mr. Ferko has no concept of what a commanding officer's duties are. Manfred von Richthofen and all commanders have a duty to their troops and country. They must employ every strategy that would accomplish the goals that are required. Ferko also contends that taking a disagreement with another officer to their superiors was an act of Prussian aristocratic snobbery. Indeed, Ferko is forgetting that the unquestioning adherence to the orders of a superior is what got the German officer corps in so much trouble during the Nuremberg trials in the second war. Anyone with basic knowledge of the military, from Julius Caesar to Colin Powell, must realize that every officer who desires to have a successful career must be part politician. If Mr. Ferko believes an officer should not question orders or use political savvy to achieve legitimate goals, he would probably do best if he limited his writing to children's books or fantasy. I find it hard to believe that Ferko is so naive that he does not understand the role of a commanding officer. Instead, I believe the author took positions as he did so to create new controversy on an overdone topic. Unfortunately, his attempts appear sophomoric. These attempts at creating new facets on an old diamond fail. In my opinion the best (or worst) example of this occurs when Mr. Ferko writes the inevitable chapter on "Who Killed the Red Baron?". He devotes the majority of his text on the premise that Manfred von Richthofen was killed by Australian infantry after he made a forced landing due to engine damage. Ferko makes some questionable interpretations of some first-hand reports, but provides us with no real proof. Considering that von Richthofen's Fokker Triplane engine is at the Imperial War museum the least he could have done is show us the engine damage. It seems a shame that tabloid fiction is returning to World War I aviation literature (and not even at pulp prices). If your main interest is in Manfred von Richthofen, you may want this book for the many fine pictures or the color plates. However, if your interest is in historical World War I aviation you may want to pass on this book.